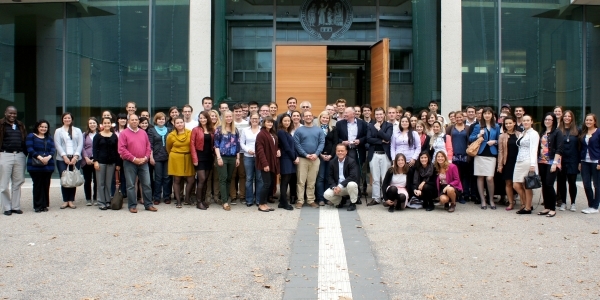 From 2 September 2012 to 6 September 2012, the Cologne Academies took place the Arbitration Academy even for the 10th time. At the occasion of this anniversary, the Academies kicked off with a special event on Sunday: Prof. Dr. Karl Heinz-Böckstiegel and Prof. Dr. Klaus Peter Berger talked about their dedication to arbitration. While following a highly interesting conversation between these two arbitration experts, the students learned how their careers as international arbitrators began and why they are passionate about international arbitration. Moreover, they received valuable insights and recommendations for future careers in that field. The Arbitration Academy started on Monday with an introduction to a mock case involving the failure to perform a contract due to circumstances that were possibly to be regarded as force major. The Academy revolved around the commencement and advance of the arbitration proceedings in this case. After the presentation of the facts of the case, Professor Dr. Klaus Peter Berger, Stefan Hoffmann and Ruth Mosch covered the basics of arbitral procedure in connection with the commencement of the proceedings: the do’s and don’ts in drafting of arbitration agreements, an introduction in case analysis techniques, and an examination of Claimant’s and Respondent’s briefs. The second day was dedicated to oral advocacy and to preparing the opening statements on jurisdiction and on the merits under the guidance of Dr. Boris Kasolowsky. The day ended with one of the highlights of the social program of the Academies: A boat trip on the river Rhine with a dinner buffet. On the third day, Professor Martin Hunter and Steven Finizio introduced the participants to the taking of evidence. A hearing on document production was prepared and witnesses were heard in cross-examination. At the end of day, the final award on the merits of the case was rendered. On Thursday, the last day of the Academies, Dr. Stefan Kröll discussed examples for arbitral decision-making, such as orders, interim awards, partial awards, final awards, and issues that can arise after an award has been rendered: the interpretation of the award and its correction and possible setting aside. The Academies ended with a joint session of the Arbitration Academy and the Mediation Academy. The outcomes of both groups were compared to each other and the relationship between mediation and arbitration and its relative advantages were discussed. The 10th Arbitration Academy was a very enriching experience that without a doubt has enhanced the participants’ theoretical and practical knowledge of arbitration. It has also been a fantastic opportunity to meet interesting and like-minded people from around the world and I can recommend it to anyone who wants to learn more about arbitration.